Denny Jump (Bellevue, WA, United States) on 24 October 2011 in Landscape & Rural. Thanks to everyone for tapping in to my blog and posting your wonderful comments. Although I have not posted much, lately, i have enjoyed your comments and hope to get back into the swing of things soon. 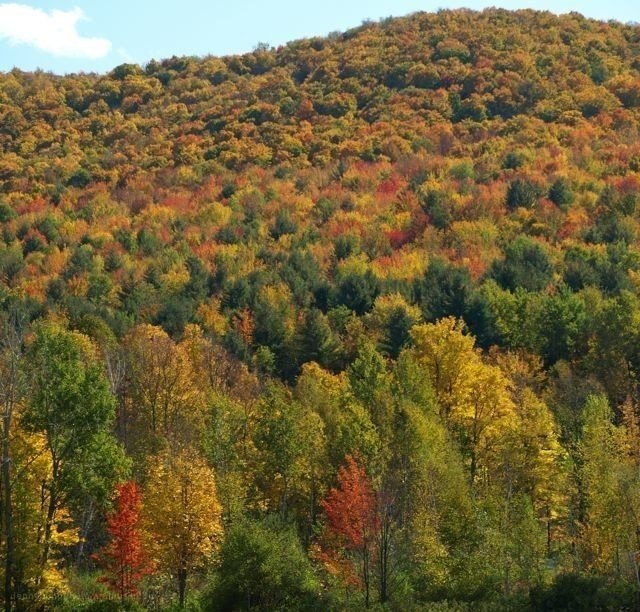 Meantime, here is a look at a typical Vermont mountainside during peak colour season in October - I hope you enjpy! this is why autumn is my favorite time of year ~ simply stunningly beautiful!!! @Eric Cousineau: Yes it is especially beautiful in the east in autumn! Thank you Eric! Beautiful autumn colors and scenery, you had a great view! Wonderful capture! Glorious shot, Denny - a magnificent autumn tapestry! @Stephen: Hi Stephen! Thank you very much sir! A gorgeous rolling expanse of eye candy! Looks just like my province of Ontario. Sweet shot, Denny. @Rick: You are quite right I am sure...I wuld love to come up !! Beautiful, like a Monet painting. Nice work Denny. @Ralph Jones: Thanks very much Ralph,,,what happened to the Lions yesterday!?! Nature gives generally pure beauty and sometimes becomes more than splendid. Love that tapestry of colors Denny! @Jason Politte: Hi Jason -Thanks very much - this was 2010 - a good year there! @Tamara: Hi Tamara - Thank yu so much! I really loved your image today - very cute and joydul but also a fantastic composition for sure! Artists think they can put on a pretty show, but for me... Mother nature steals the limelight every time. The colours on display here are wonderful. Your viewpoint for the shot is great. I'm very jealous of where you live. Wow Denny, this is gorgeous! Such beautiful autumn color. Spectacular! Denny this is a precious photo. Beautiful depiction of FALL. Beautiful colors of Autumn captured here! The sporadic appearance of evergreens adds nice texture to this composition as well. Glorious colors, Denny ... thanks for the memories! An amazing display. We don't have that kind of profuse forest of color here in Kyoto, but more like the beauty of a single tree set in an elegant garden. Both are beautiful! Wow, you went a the perfect time! This is so beauiful. Pictures like these make me miss the East Coast. Fall is my favorite time of year. That's so beautiful! Nice photo. It look like autmn in finnish forest. here we say that colours to "ruska". really beautiful carpet of color! This is what I miss, living in Nebraska...the hills blanketed with the brilliant crazy-quilt colors of Fall, all at once! We would see all this around our home town of Buffalo NY. Here in Omaha, colors go by in stages, like a series of marching bands. But the color seems never quite so alive as in New England. Fall in New England is on my bucket list! Lovely.